Reports suggest Luke Varney is on course to sign for Forest on loan until the end of the season from fellow strugglers Portsmouth. 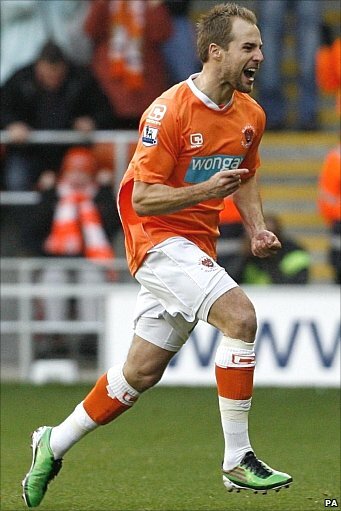 Varney is a 29 year old, experienced Championship striker, who most of us remember for his brilliance at Blackpool in the early part of last season. Throughout his career, Varney has primarily been a hardworking striker with a touch of pace and an ability to pull something out of the bag. His downfall is his general lack of confidence, which saw him fail at both Derby and Charlton in particular. Varney does however tend to make immediate impacts at new clubs and hopefully the confidence issue will not be a problem with Cotterill - someone who has admired Varney from afar and actually signed for Pompey. Maybe he could have a McCleary style impact on Varney? Now I know what you are all thinking, what do we need another striker for? I suppose the answer is simple. We need goals and more options other than Tudgay and Blackstock. Tudgay and Blackstock can not be solely relied upon to produce week in, week out at the moment due to the fixture pile up we have between now and Easter. While we have Findley, McGoldrick, Miller, Harewood and Derbyshire as reserves, it is safe to assume 3 of them will never play for us again, one is too injury prone to pin hopes on and the other does not have goals in his locker and should be used as a winger. In all honesty, if we need to sign 23 strikers to scores goals to keep us up this season, so be it. Hopefully Varney's historic track record of making immediate impacts will get us 3 or 4 more crucial points on the board. Where the money for this deal is coming from though is another question entirely. We will see what the next day or so brings.